The sanctuary jurisdictions are listed below. 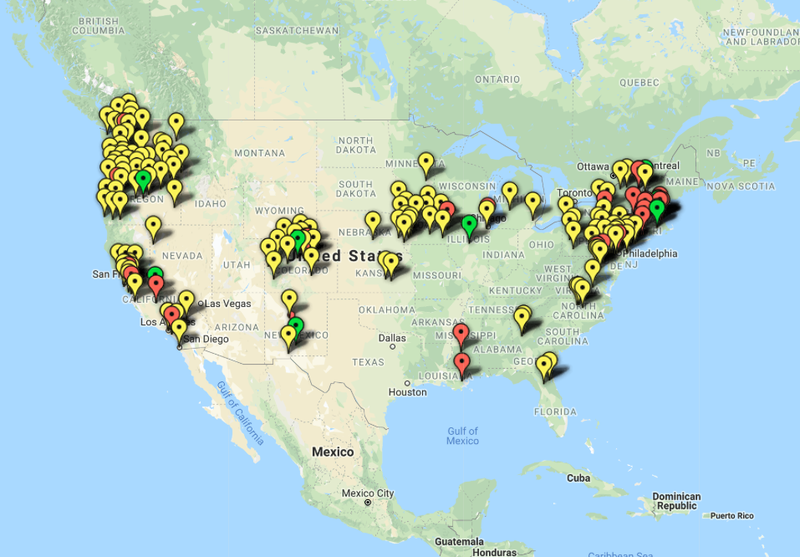 These cities, counties, and states have laws, ordinances, regulations, resolutions, policies, or other practices that obstruct immigration enforcement and shield criminals from ICE — either by refusing to or prohibiting agencies from complying with ICE detainers, imposing unreasonable conditions on detainer acceptance, denying ICE access to interview incarcerated aliens, or otherwise impeding communication or information exchanges between their personnel and federal immigration officers. A detainer is the primary tool used by ICE to gain custody of criminal aliens for deportation. It is a notice to another law enforcement agency that ICE intends to assume custody of an alien and includes information on the alien's previous criminal history, immigration violations, and potential threat to public safety or security. The Department of Justice announced yesterday that sanctuary jurisdictions will lose access to certain federal law enforcement grants in 2017 if they prohibit officials from communicating with ICE, if they block ICE from interviewing jail inmates, and if they fail to notify ICE of the pending release of criminal aliens ICE is seeking to deport. These particular grants, known as the Byrne Justice Assistance Grants, are the largest source of federal criminal justice funds for state, local and tribal authorities.